Motherhood. It’s a truly beautiful thing. Growing up as little girls we dream of being moms; rocking little ones to sleep, pushing them around in strollers. Once you become a mother you realize how incredibly awesome and wonderful it is to have the sweet little fingers of a child holding your hand, touching your face and reaching up to you. It’s a calling to be sure. A gift from God, not to be taken lightly. If I didn’t believe that, I wouldn't be part of this blog. I’m not here today to talk about how we can be better moms and love our families more. I’m going to talk about something a little more difficult. This passage always rubbed me the wrong way. It always seemed so heartless and blunt. Jesus knows I love him more than anything. I mean come on, he is the only person who died for me, of course I love him. However, this past year I've had to do more than say these words, I’ve actually had to live them out. I’m not going to lie, it has been the hardest thing I’ve ever had to do. When my husband and I felt God’s calling to adoption over a year ago, we started taking steps forward and seeking God’s direction. As he continued to guide us we felt more and more confident in the calling and eventually jumped head first into the Milwaukee County Foster Care system. Before we did, many people in our lives voiced their concerns over how our children would handle everything: a new child in our home, the special needs they might bring, the loss of attention and the possibility of that child not staying permanently. We told them all the same thing: "If God was truly calling us to this life, he was more than capable of handling all those details." What I didn’t know at the time is that those words are easier said than done. You see, I LOVE being a mom and I LOVE my children. I have the joy of staying home with our kids and I prided myself on my job of raising the beautiful children God had blessed us with. What I never realized is that I’d let my family become an idol to me. It is one thing to hear about how a bullet proof vest can save your life, but a whole different ball game to put one on and let someone shoot at you. I think that for all of us, motherhood (while an extremely important calling from God) can be used as an excuse to say no to other areas in our lives where God may be calling us. Now, please don’t get me wrong, I completely understand the all consuming life of a mother. We currently have a 4 year old, a 20 month old and a 16 month old. But sometimes we as moms say things like “maybe someday, once the kids are in school”, “once I have more time again” or “If I didn’t have young kids, I would love to do that.” But is that God's will or our own? Have we prayed about the opportunities that come along? Are we putting the comfort and security of our families above our call to make disciples? Are we willing to consider the fact that perhaps God could be calling you to be a mother and also serve him in another way? Our goal isn’t to raise happy American kids, but to raise children that love God and live for him. What this past year has shown me is that letting God “take over” my family, while extremely challenging, has brought more to our children than I could have ever thought. 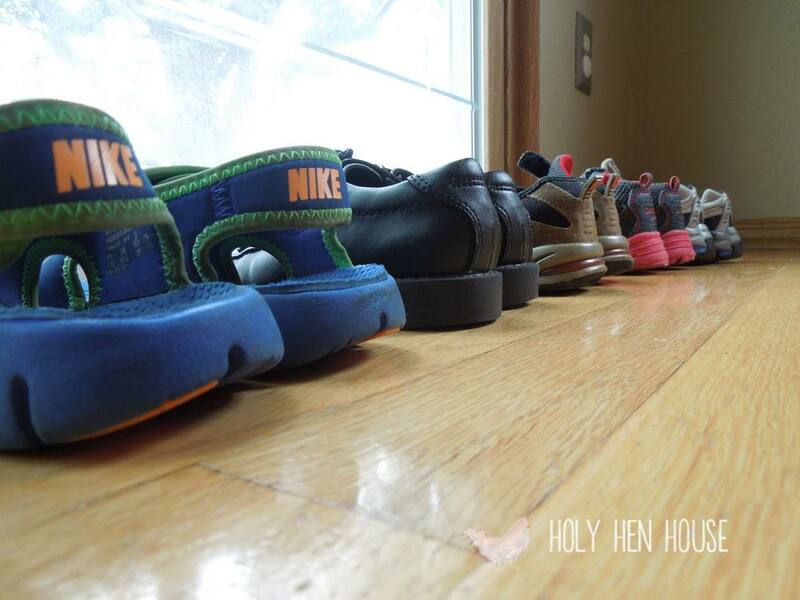 My son, at 4 years old, gets to daily serve God himself by sacrificing little things here and there to help me take care of “Autumn.” He told me the other day that he had too many shoes and that perhaps we should give some away to the kids who don’t have any. When Autumn's siblings came for a visit he sent them each home with a car for them to keep completely on his own accord. If we had said no to foster care, we would have taken away his opportunity to serve God in these ways. Yes, our kids have had to give things up, but what they have gained in exchange has far more eternal value. God might be calling you to things with your children in tow. I can’t even begin to tell you the opportunities to witness to people that have come up becauseI have three little children with me. Today I’d like to leave you with a challenge. Are you willing to “daily take up your cross” in order to follow him? Even if that means putting him above your family? I can guarantee you, God loves your children immeasurably more than you do. In fact, he took 9 whole months just knitting them together. He won't let them slip through the cracks because you are living for him. Don’t take your calling as motherhood as a closed door to other serving opportunities in your life. Let the only limits on your life be the ones that God puts there. 1. Start with prayer today. Ask God to reveal the things in your life that you hold the most dear. Then ask God to give you a deeper love for him, one that trumps even those things that came to mind. 2. Ask God to open your eyes to the opportunities for service that he has placed in your life.